SMDC-ONE (Space Missile Defense Command - Operational Nanosatellite Effect) is a program to develop a small experimental communications satellite constellation for the US Army Space and Missile Defense Command. Demonstrate the ability to rapidly design and develop militarily relevant low cost spacecraft. Receive packetized data from multiple Unattended Ground Sensors (UGS). Transmit that data to ground stations within the SMDC-ONE ground track. Provide real time voice and text message data relay to and from field deployed tactical radio systems. Demonstrate SMDC-ONE operational life time of 12 months or longer. Eight satellites have been manufactured. Another one has built to a slightly modified design in a joint project with ORS (Operationally Responsive Space Office). This satellite, also known as ORSES (Operationally Responsive Space Enabler Satellite), features an SMDC-ONE satellite bus with an advanced Software Defined Radio and Type-1 encryption module. 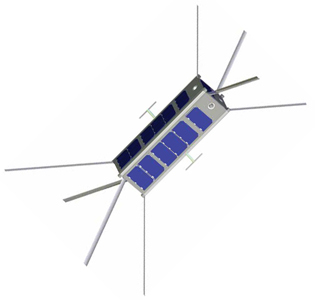 The first SMDC-ONE nanosatellite was launched 8 December 2010, into a slightly elliptical orbit about 185 miles above the Earth. Ground stations in Huntsville, Ala., and Colorado Springs, Colo., sent messages back and forth via the satellite, demonstrating beyond-line-of-sight and overthe-horizon communications between the ground stations located more than 1,000 miles apart. Due to the very low orbit altitude, the satellite re-entered the earth’s atmosphere and disintegrated 35 days after launch, having performed exceptionally well throughout its five weeks in space. This brief space technology demonstration indicated great potential for these very small satellites. In September 2012, two additional SMDC-ONE spacecraft were launched as auxiliary payloads on National Reconnaissance Office Launch 36 (NRO L-36) aboard an ATLAS V rocket to allow for more complete testing . The two SMDC-ONE satellites launched on OUTSat were manifested as SMDC-ONE 2.1 (Able) and SMDC-ONE 2.2 (Baker). The primary mission objective for the SMDC-ONEs was to demonstrate voice and data communications through a low earth orbit satellite using military standard radios, which had never been done before. Able and Baker have both provided valuable test data since their deployment on-orbit. Able continued to provide usable data for more than one year, exceeding the expected lifetime. Baker provided valuable operations data during its first two months on-orbit, since that time it has gone radio silent. Two final SMDC-ONE satellites, SMDC-ONE 3.1 (Charlie) and SMDC-ONE 3.2 (David) were launched in December 2013 on NRO-L39’s auxiliary payload mission termed Government Experimental Multi-Satellite, or GEMSat. These satellites were launched to continue the demonstration and evaluation of nanosatellites as game changing technologies. The follow up program with improved capabilities is SNaP. SMDC-ONE x - with ?